Messier 51 (M51), better known as the Whirlpool Galaxy, spiral galaxy located in the constellation Canes Venatici. The Whirlpool Galaxy has an apparent magnitude of 8.4 and lies at an approximate distance of 23 million light years from Earth. Messier 51 is one of the easiest Messier objects to find. The galaxy is positioned only 3.5 degrees southwest of Alkaid, Eta Ursae Majoris, the star that marks the end of the Dipper’s handle, or the tip of the Great Bear‘s tail. 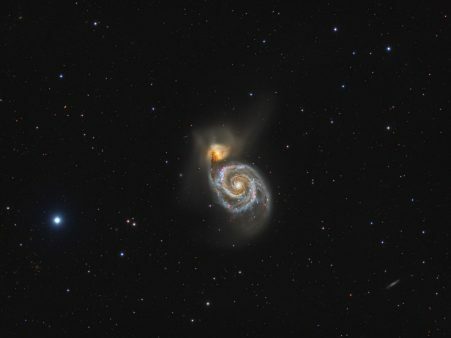 In good conditions, the Whirlpool Galaxy can be seen in binoculars. It is quite bright and appears face-on, which makes it a popular target among amateur astronomers and astrophotographers. M51 is also the brightest example of an interacting spiral galaxy in the sky. Messier 51 appears as a patch of light in 10×50 binoculars, while small telescopes show a more diffuse patch of light with a bright central region. The galaxy’s bright core appears more defined in 8-inch instruments, which also reveal the galaxy’s large halo and a hint of the dark dust lanes and spiral arms. M51’s smaller companion galaxy, NGC 5195, is also visible, but the bridge connecting the two can only be detected in larger instruments.